Her Idyllic childhood was disrupted when at the age of ten Barbara was suddenly taken away from her family, as she was collecting water. She is one of the people known as the 'stolen generation'. Barbara married Mervyn Torres and in 1969 they moved to the remote community of Papunya, where Mervyn was a field officer. Little did they know they were about to witness the birth of the Aboriginal Art Movement, when the Papunya men began painting their stories for an external art market. In 1977, Barbara returned to the land of her birth with her three children for good. On returning to her home, she rekindled her special relationship with Emily Kame Kngwarreye, who was a famous batik artist by then. The Utopia women were all well-known for their beautiful batiks, the proceeds from which contributed to the Aboriginal community buying back the region of Utopia in 1974. Barbara Weir was active in the local land rights movement during the 1970s and worked towards gaining Country. At the same time, Barbara became interested in batik and showed a flair and talent for it. After witnessing the events that took place in Papunya, Barbara made the natural transition to painting in 1988, which coincided with a project from CAAMA shop which introduced the Utopia Batik Group to painting on canvas with acrylic paints. Early works by Barbara reveal how she experimented with colour and style to tell her stories linked to her culture. In some instances, earthier tones, overt iconography and dot work float above a black background, while in other paintings there are linear motifs of body paint designs that echo the artworks of Barbara's aunt, fellow esteemed artist Ada Bird. 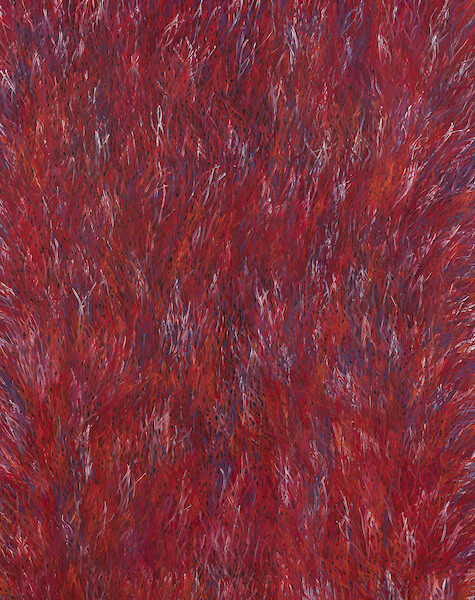 In 1996, after the death of Emily Kame Kngwarreye, Barbara concentrated on developing her skills as an artist. She soon attracted interest from collectors by producing works that were contemporary in style, including her now renowned 'Grass Seed' and 'Mother's Country' paintings. Barbara has travelled widely and has been to America, Europe and Asia to paint and exhibit her work. She has also been honored by recognition by many art awards, including being a multiple finalist in the Peak Indigenous Awards, the Telstra NATSIAA and in the recent 2018 Paddington Art Prize.